India is a country of close knitted families and having lot of reasons to celebrate owing to its diversified culture, customs and religion. Numerous occasions arise where gifts are exchanged. In fact gifting each other is a symbol of love and affection and can also be a symbol of social status. However, many a times gifts can also be a part of tax planning / tax evasion. While tax planning done within the framework of law is permissible, tax evasion is prohibited and can be penalised. It is highly important to have a basic understanding of taxation on gifts in India to avoid any ignorant /unplanned tax outflow. 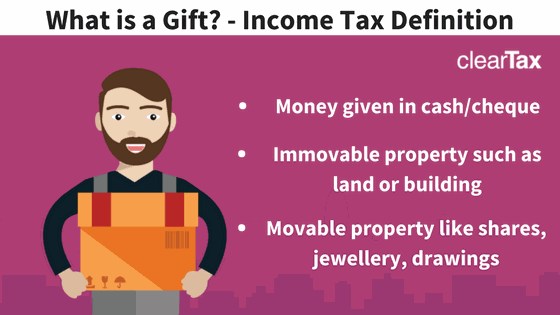 As per the law as it stands today which was amended in 2017, gift received by any person by any person or persons are taxed in the hands of recipient under the head ‘Income from other sources’ at normal tax rates. We have discussed below what kind of gifts are covered and its quantum to be taxed. Further, in case the taxpayer has questioned or disputed the stamp duty value adopted by stamp duty valuation authority as per Section 50C, tax officer is required to refer the valuation to a valuation officer (VO) and the VO is required to call for records and give an opportunity of being heard to taxpayer and pass an order in writing of value he has arrived. For the purpose of gift tax, lower of stamp duty value or value arrived by VO is required to be adopted. Due to extensive tax planning using gifts, gifts in India generally fall under the scrutiny of the tax department, especially if the quantum is huge. Hence, it may be advisable to maintain documentation to establish genuineness of gift received and sufficient source of funds with the donor to justify the gift. What do you do when banks deduct excess TDS? How to Claim Relief under Section 89(1) on Salary Arrears?